You are the movie. 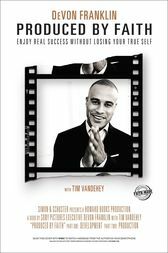 Produced by Faith parallels each step of the Hollywood filmmaking process with the faith-making process God uses to turn your career into a success. You will discover that it is possible to be both wildly successful and completely committed to God—and that you will be even more successful when you place your faith at the center of your career. You can unleash the power of your faith as your greatest professional advantage and use the compass of God’s Word to guide you to your true passion and purpose in life.